Recently at one of my money-saving seminars, an attendee tearfully shared with me that she and her husband are not on the same page with their finances. She explained that it is cause of so much dissension that she is not even motivated to try and save money. Each of them resents how the other spends and handles money. We are all the product of our upbringing and some of our habits are deeply ingrained. If you are not on the same page as your financial partner, now is the time to get there. Statistics have shown that money and finances are the primary cause of divorce. And divorce is not a money-saving strategy. You cannot count the cost of the emotional toll that divorce takes on the entire family. Often the devil is in the details. Are you frittering away your future security on toys, electronics, retail shopping, expensive meals and drinks? Do you have expensive hobbies that are causing a financial strain on the family? Is one of you willing to work at it while the other just wants to spend for today? There is too much at stake NOT to work together for the common good. You got into this relationship to be a team, right? 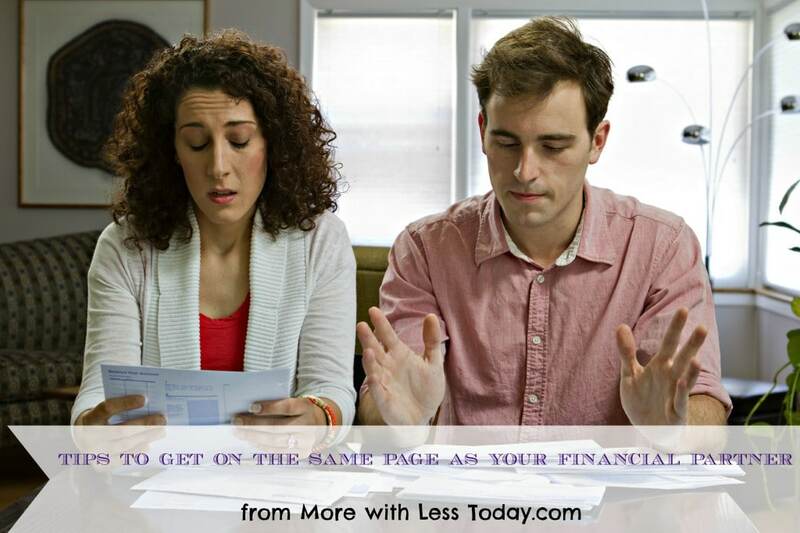 Consider these 10 tips to get on the same page as your financial partner. If you have a comment or an idea to share, I welcome your input in the comments. 1. Create an atmosphere that fosters cooperation and a mutual desire to start make improvements. Begin with some ground rules and make a commitment to honesty, and mutual respect. 2. Start small. Talking about finances will be on ongoing conversation. You don’t have to figure everything out in one sitting. Make plans to do a few frugal projects around the house together, plan a frugal date, volunteer, or cook a meal together. Enjoy being together. 3. Talk about your goals, your individual dreams and milestones that are on the horizon. Try to learn something new about your partner and use this time to knit your hearts together. Make some future plans. Get excited about your goals and the things you would love to do together. 4. Take stock of your current financial situation and put it in writing. List your assets, income sources, and debts. Take a look at last year’s expenses and examine how much you are spending on housing, utilities, food, entertainment, transportation, vacations, discretionary spending, and everything else. 5. Discuss the needed steps get financially stable. Make sure you have an emergency fund and get a few months’ worth of living expenses saved. Next, make a plan to pay off debt. Once debt is paid, than those funds can be redirected toward savings. Discuss how to get spending under control so that you are living beneath your means. 6. Put everything on the table. No hiding of assets or spending. Compromise and be willing to listen. Make a pact that either of you can speak their mind without hesitation. Give each other the freedom to be vulnerable and open. 7. Find ways to spend less, cut expenses, and trim spending. If possible, find some discretionary money to allow each partner to spend as they please. Both my husband and I have side jobs where we make a little extra money. This is our discretionary money and this method works for us. Just by changing the way you grocery shop and meal plan, most families can find at least $100 of extra money each month from their food spending. 8. Decide on some small measurable goals such as only $20 this week for food and drink outside the house, or put an extra $300 this month toward the credit card bill. 9. Aim to meet at least monthly if not weekly to review your progress and put it on your calendars. 10. Get help if you need it. If you need a marriage counselor to get you started, then do it. The cost of not getting to the root of your problems is too high. If you need help managing asserts, work with a financial advisor and then meet with him or her on a regular basis. If something is wrong with your finances, your best hope of fixing them is to work together with your partner. Your dreams are not going to happen unless you are on the same financial page as your partner. Don’t give up! The future is calling. Great tips! Neither my first husband or Husband 2.0 wanted anything to do with discussing finances. To keep them informed, but not create an argument, my strategy has been to let them (now just the current one!) know where things are at in a quick, concise, non-emotional way. I also role-model smart planning and spending techniques. I am careful to not sound like I am bragging, nagging or being disrespectful. I just point out things I am trying that are working well for us.